While mainstream media spends countless hours covering story after story of fictitious chemical weapons allegations against the Syrian Arab Army and tries to demonize the democratically elected President Dr. Bashar Al Assad and his wife they spend little to no time covering important stories that should receive at least some airtime. One such issue is the Christian genocide currently taking place in the Middle East and particularly in Syria during this imposed war and invasion. We have been bombarded with lies and propaganda in mainstream and social media which have fueled this 6+ year war. Tomorrow marks the 6 year anniversary of this war which was planned as early as 1949 by the US. The CIA admits orchestrating Syrian Coup of March 1949 HERE. This was just the first attempt of many to destabilize Syria by the USA. In order to fully understand an important aspect of this war that affects religious minorities in Syria, it’s best to hear directly from those who have been persecuted based on their faith. One particular religious minority will be the focus of this article. This minority, in particular, has not faired well and has been subjected to heinous crimes against humanity and persecution throughout this war is Christianity. Christians are being targeted based solely on their faith. Effectively, a Christian Genocide is currently taking place in Syria by the various armed terrorist groups, it’s best to hear directly from Christians in Syria that have been living this reality for over six years now. This is not to imply that Christians are the only minority that have been targeted, other minorities have been covered in other articles. Alawites, Yezidis, Shia, have also dealt with their fair share of turmoil one such example was the Adra Massacre where victims were thrown into the local bakery ovens and burnt alive. Sunni’s have been massacred as well. The anti-Islamic terrorist factions have terrorized everyone at some point but the false allegation that Sunni’s have been targeted more so than the minorities is one without merit and meant to demonize the Shi’a dominated military factions especially those from Iran and Hezbollah from Lebanon. An ISIS fighter stands in the rubble of St. Elian monastery, an Assyrian monastery from the 5th century after it has been destroyed. In order to fully understand the Christian Genocide currently taking place in Syria by the various armed terrorist groups, it’s best to hear directly from Christians in Syria that have been living this reality for over six years now. One can only imagine what life must be like for all Syrians at this time and specifically those that are targeted based on their faith. Yasmine agreed to do an interview where she shares her insights on this topic, from Damascus where she has resided most of her life. She is one of the Syrian voices that are part of the “Syrians Speak Out” series that will take us on a journey to discover the truth during the war in Syria, that I wrote for Mint Press News. Yasmine is an engineer who then went on to get her Masters in Business Administration (MBA) and resides in Damascus the oldest city to be continuously inhabited in the world. Yasmine is Aramean Syriac Orthodox originally from Al Qamishly in the North East of Syria but grew up in Damascus. Damascus is nicknamed the City of Jasmine (Yasmin in Arabic). Yasmine contacted me on Facebook recently after reading my articles and posts. We discussed the situation there and her frustration with the lies being reported. I asked if she would want to tell her story, she eagerly agreed. Shortly after our talk, her Facebook account was blocked and she hasn’t been able to come back on Facebook since then. Also, oddly enough only my messages are visible from our conversation. A few days ago her friend reached out to me and asked for my email and she sent me “Memoir of a Syrian girl” detailing her experience living in Damascus before and during the war. I will be putting that in a separate article. I asked her since she is a Christian in Syria if she would be willing to answer some questions and she agreed. The questions were created in collaboration with my friend Mark Taliano a retired teacher who contributes to Global Research and visited Syria in 2016. Mark is also passionate about spreading the truth about Syria and we have worked on previous articles for Global Research. He wrote about his experience in Voices from Syria an e-book. Yasmine’s answers have not been modified except that she did send me a follow-up email asking if she could add more information to her previous answers. Her answers have been updated in this article, to reflect these additions. What a pleasure it is to hear from real people who are not paid to spread propaganda like Lina AlShamy, Bana Alabed, Bilal Abdul Kareem who were the cast of actors that put on quite a show during Aleppo’s liberation which they turned 180 degrees into #Aleppocaust. Sarah: When the West’s terrorist proxies slaughter and commit genocide against the indigenous Christian population, as they did, for example, in Kessab, Syria, are they attempting to “erase history”? Yasmine: Not only history, when Wahhabists started in KSA they destroyed everything that has relation to history, even the grave of the prophet is destroyed, they do not care for it, in Afghanistan they destroyed statues that were thousands of years old, they are a destruction machine of everything that has to do with civilization. Sarah: When Western terrorists occupy towns like Maloula, Syria, and destroy Christian religious icons is this an attempt to erase history? Yasmine: They want to destroy the history and Christianity, Christians were always targeted by those radicals, it is their ideology to not accept any one who is different. Sarah: When the Western terrorists target Muslim and/or Christian communities, are they, or their Imperial masters, attempting to destroy the country by creating sectarian warfare? Yasmine: Of course, the sectarian warfare serves the agenda, it was the plan for the Middle East to be in perpetual state of chaos, which in the days of Bush Jr was called the creative chaos or constructive chaos, this chaos serves Israel. Sarah: Are the imperialists attempting to create warring ethnic and/or religious enclaves? Yasmine: Of course, it is their target, religion is the opium of nations, it is the method to lead the whole destruction game. Sarah: Are the Empire’s divide and conquer strategies in Syria working, or does most of the Syrian population remain unified? Yasmine: There must have been some who sympathize with Wahhabists, and these will never seize to exist unless the world fights the source of them, the sources of Wahhabist ideology are in Egypt and KSA, and unless they are totally fought, they will always have followers around the world. Another thing, to be honest, a government like Bashar Assad was able to protect us from those extremists, also in the days of Hafez Assad, we were protected. If people like to name him a dictator go ahead, but please do not tell me the West is protecting us. Hafez Assad was protecting us, Bashar Assad is protecting us. One thing leads to the other, I wanted to say the sources of terrorists should be dried up, and the rest of the Syrians are able to live with each other, we were always able to live together. Whereas the West and its proxies support the dogma of the House Of Saud and Wahhabism, they are condemning Christians to death and genocide. Sarah: If populations in the United States or Canada, for example, were aware of this, would they accept the truth? Would they act on it by contacting their churches and their political representatives? Yasmine: I do trust the people, but never trust their governments. After six years of government change/dirty war against Syria, is ignorance of the truth still a viable excuse? It is a shame to say that there are people who do not know that there are Wahhabists sheikhs leading the blind people like a herd towards the destruction of the whole area, for the interests of a small party. Sarah: When the West closed embassies and blocked diplomatic channels in Syria, were they doing this with the intent of hiding their crimes? Yasmine: It did not hide their crimes, it showed their crimes, if they really had the intention to help the Syrians, they would have kept the doors of their embassies open, so they keep their eye on the status in Syria. So that they can see the truth, and they can help, but their intention was to destroy the country to move on to the next step. So they closed their doors and left. 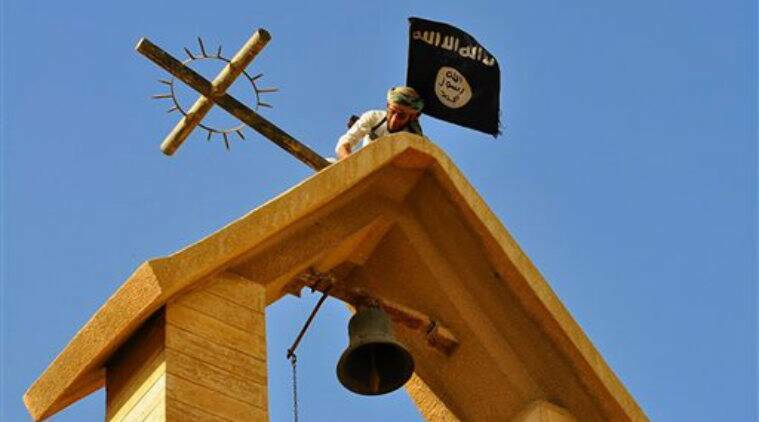 Sarah: To what degree are the West’s lies about Syria a danger to Christians living in Syria? Yasmine: The continuous lies of the West were the cause of huge damage to the Christians, not only in Syria, but in the whole Middle East area. 1- The Crusades: Till now some ignorant people think that Christians of the ME are an extension to the Western Christians, so we are always accused of what Europeans did in the old days, so they say not only Wahhabists are criminals, you did this and that in the past. Especially when referring to when Europeans built fellow kingdoms in the ME. 2- The Christian mercenaries: In the days of Sultan Abdul Hamid the Wali of the Ottoman State, Muslims were objecting to the activities of the Christian mercenaries coming from EU, but back then he said they promised me not to convert a single Muslim to Christianity, they only want to convert Orthodox to Catholic or Protestant, to make Christians into smaller groups to make it easier to get rid of them. So when the genocides started, the Ottoman soldiers claimed only killing Catholics because they have relationships with the West, but the killing went on till they killed millions of all the Christian groups. 3- In the first world war, when the West wanted to divide Iraq into two states, under the supervision of Britain, the Assyrians (Ashouriyien) demanded to have a state for them since they are the original inhabitants of the country, and it is their history, but the Zionist lobby interfered back then and prevented the Assyrians from having their own country. We know it is the revenge of the Jews against Assyrians because of the Babylonian captivity, it is their eternal hate. The West puts the Zionist agenda above the whole world, even above their own people. We know the history, we lived it, our parents lived it, we can never trust the West. Sarah: If the West were to succeed in installing an al Qaeda/ISIS stooge government in Syria, would Christians be completely cleansed from Syria? Yasmine: We will have to pay aljizia (a tax), they would take our women as slaves, or we would be forced to convert to their Islam, or just die. Actually, this happened in Iraq to one of my relatives, they were attacked by a group of terrorists and were told that they either convert to Islam or get killed or they leave immediately, so the family chose to leave immediately, they were not allowed to carry anything with them, only their identities. I imagine we will be the same. Yasmine adds: I wanted to add something for the questions, for now, we are all sure that explosions in Qamishli are done by Kurds, they want to take over the area and I think it is strange that the government didn’t consider to protect Christians. As for the government, I think they have done what they can to protect Syrian’s, although that might have been enough depending on who you ask. Christian militias were armed in the Al Hassakah governorate by the Syrian Arab Army so that they can protect their own communities such as Sotooro. While other Christian militia groups joined the Kurdish-led US-funded SDF. I think many of us can agree that this bloody war in Syria needs to end before we see a complete cleansing of the indigenous people of this historically rich country. This is something that all of us should be very concerned with regardless of our religions before it is too late. This genocide needs to end now. This war needs to end. All death and destruction needs to end in Syria, and around the world. Note: Yasmine is an alias we will be using for the interviewee to protect her identity.